As of today, The Aquaman Shrine is ten years old. I know, I can't believe it either! Never, in my wildest dreams, that when I absent-mindedly started taking cruddy pictures of the various orange-and-green bric-a-brac I had been accumulating I would still be doing it a decade later, and that it would grow to be one of the major decision of my life. I'm not going to go into a long ramble about everything, and obviously I don't devote the same amount of energy to the Shrine like I used to. That's partly because A)I've been doing it for a decade, and B)Aquaman just isn't the put-upon joke he was when I started. For Neptune's Sake, he's a movie star now! That turn of events would have seemed even more unlikely that same ten years ago. For those of you who still stop by, my sincerest thanks. I've made a lot of friends thanks to the Shrine, and my life is the better for it. Semper Aqua! 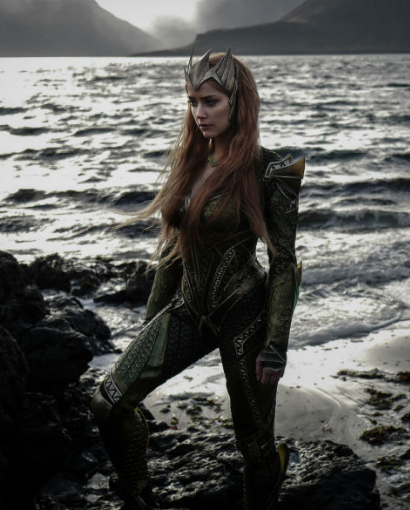 Post Script: By the way, it sure was nice of Warner Bros. to release the first official glimpse of Amber Heard as Mera. What a great anniversary present! Rob, thanks for ten great years! And don't doubt for a second that the Shrine has been just as important to some of us out here in the audience, too. Obviously the Shrine opened up friendships to me that blossomed into endeavors I never thought I'd be engaged in. Plus it remains just a fun place to stop and take a gander at. Happy Anniversary! Congrats- What a ten year ride it has been. Happy Anniversary TAS and Rob!!! Hope there come 10 more! Happy anniversary to the Shrine, and thank you Rob for providing so much entertainment and for being such a positive force in the world of comics, especially for my favorite character. It has been an absolute pleasure to read and listen to your work. Thank you for constantly stoking my own fandom fires. Wow, they did a pretty good job on Mera. She looks darn near right. If WB wasn't so terrified of color, she'd be spot-on. As is, she looks better than any other character we've seen, save Wonder Woman. Happy Anniversary! 10 years - Wow! Thanks for it all, it is always appreciated. Rob, thank you for all your hard work, and for giving us a place where our personal fandom can mingle with like minds. Long live the Shrine! Congratulations on 10 great years, Rob! Happy Anniversary to the site and all of your hard work Rob. It is one of my favorite sites and I look at it every week especially on the weeks a new issue comes out. It is also amazing that your site actually shaped Aquaman lore by naming the character's dog! Now we need you to have a cameo in an issue. Rob, I so appreciate your work on the shrine and all that has grown from it. Happy Anniversary and thanks! Hear, hear! Thank you for this site! I think you're putting just the right amount of work into it now, especially if it's fitting into your life balance. Hoping for 10 more great years. Outrageous! Thanks for carrying the torch for Aquaman all these years. I always look forward to the posts on TAS and the Fire and Water Network. Here's to another 10 years! Happy Anniversary Rob and the entire Shrine!! Semper Aqua!!! Congrats, Rob! Happy Birthday, TAS! Running a successful blog for 10 years IS NOT easy. I've been stopping by and lurking off-and-on for all ten years and I've always considered this one of the best comic character blogs out there. Kudos for all of your hard work! Congrats on the great anniversary, Rob! I'm grateful for having the Shrine here and on Twitter to celebrate my lifelong favorite costumed character.